Fears that the US is about to drag the rest of the world into a double-dip recession gripped investors by the throat this week, plunging markets into a dark frame of mind. It was a shocking week for equities, which plummeted on a slew of bad news. The FTSE 100 closed at 4838.09 on Friday, up 0.7pc on the day but down 4.1pc on the week. The German DAX was 4pc lower on the week, while France's CAC 40 and the US Dow Jones were both down 4.9pc after a week to forget. "Markets seem to be in the mood to worry, as they contemplate what the second half of 2010 will bring," said Ian Harwood of Evolution Securities. The focus this week switched to the US, and a string of terrible data which prompted fears that recovery in the world's largest economy is losing steam, and is about to lead the rest of the world into a double dip. There are concerns too that growth in China is slowing and may not be able to provide sufficient support to the rest of the world. And lastly, while the fevered panic over the eurozone debt crisis, impending austerity, and social unrest has abated, anxiety has not been erased. The bad news from the US this week included a nasty drop in consumer confidence; a fall in US non-farm payrolls; and plunging home sales. The UK, reliant on world trade to give its fragile recovery wings as it embarks on an eye-watering fiscal squeeze, would inevitably be pulled down with the US if a renewed slump took hold. And there were signs this week that some areas of the UK economy are already becoming vulnerable to a second shock. A Bank of England report suggested British households are in store for a second credit crisis, with banks and building societies expecting to rein in lending yet again; the recovery in house prices all but stalled in June, with prices rising just 0.1pc according to Nationwide; and the manufacturing PMI indicated a sharp slowdown in exports growth in June. It is not just the FTSE 100 which is reflecting fears of a double dip in the UK, Bank of England policymakers have given explicit warnings too. Adam Posen, a member of the Bank's Monetary Policy Committee, said "the renewal of a severe recession" was a very real possibility. "Much of what determines our outlook will take place beyond our borders and certainly beyond the MPC's remit," he added. Not terribly heartening. 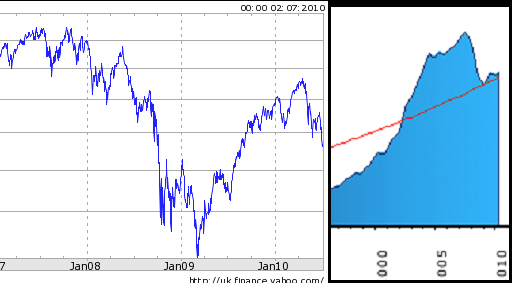 is FTSE 100 tied to HPI somehow?